This enriched, nourishing body moisturizer cleverly combines serious skin care benefits with a healthy touch of bronze. Infused with soothing aloe vera, this lotion will help give you smoother skin while building a gradual golden tan, every day. The innovative Aromaguard™ fragrance technology eliminates the tell-tale self tan aroma by a minimum of 70%. I loved this! It has a nice color, nice smell, easy application, very lightweight, dried really fast. 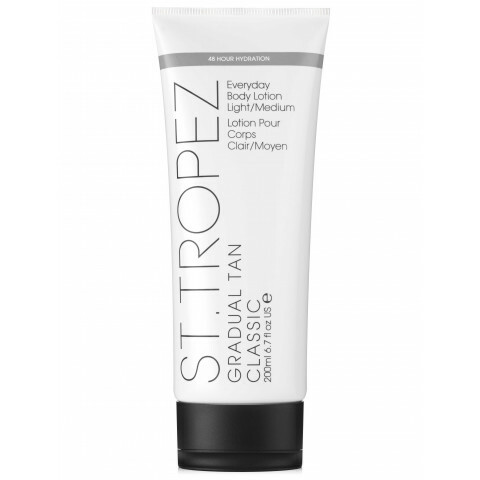 Great self tanning lotion that you apply after bathing and builds to a natureal, glowing tan. My only regret is I wish it were more hydrating. It is uncomfortable to apply unless you moisturize prior to application, which is an extra step.